A solid, high-security padlock made to work with 3/8" (10mm) square security chain. It's a solid piece of brass and hardened steel that leaves an impression of both quality and durability. Well, it weighs 1.92 lbs (875 g) and is a handful for anyone with average hands. It's a great balance of feeling and looking really solid without being too big or bulky. You can easily slip this into your backpack, purse, etc. and tote it without weighing yourself down. We know you will be impressed! This is a true, high-security padlock that was hand selected to work with 10mm square chain. Thieves hate these locks due to the high-quality materials used and their exclusive shape that makes them practically impossible to grip with traditional cutters or other common tools. 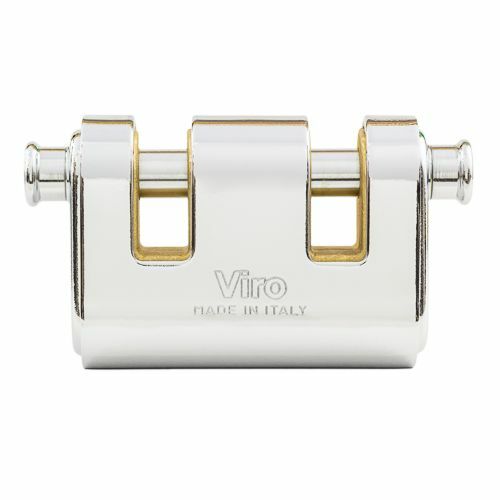 The body is solid forged brass with 3mm thick case-hardened, tempered, copper, nickel and chrome plated steel main armor. The bolt is also case-hardened, tempered, copper, nickel and chrome plated steel rotating resistant to attack dead-bolt. 7-pin plug, pull-resistant, with case-hardened, tempered, copper, nickel and chrome plated steel anti-drill plate. 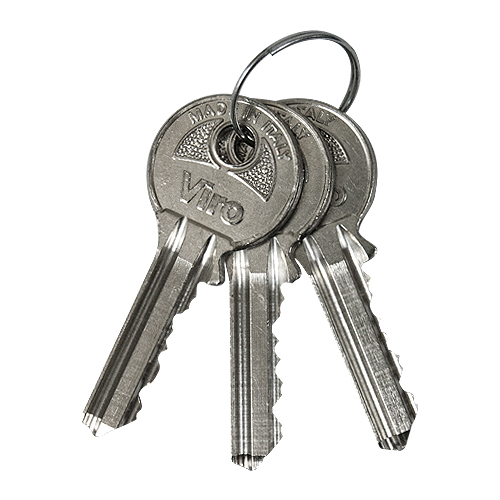 Supplied with three Viro Top Security profile nickel-plated brass keys. We know that's a lot of tech speak, but the point is that this is a true security lock. We know you will be satisfied with its inherent durability and toughness, not to mention its looks (there is exceptional attention to detail). Can links other than the end links of the Pewag chain be closed up in this lock? I will need to use at least one link on the chain that is not an end link. Unfortunately no, it is close, but a mid-link will not fit due to the tight individual pockets on this padlock. Does this fit the 7mm Pewag chain? 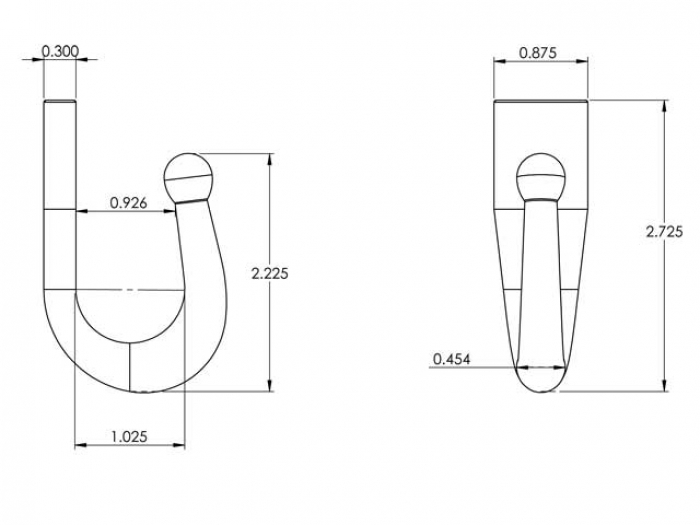 The pin diameter and the 7mm internal dimension are both listed as 0.39". According to the fit chart, the small 7mm chain does not fit this padlock. You can view the fit chart by clicking on the "Product Notes" tab. Will this lock work with the 1/2" Galv square link chain? No, this lock does not fit the Pewag 12mm or Laclede 13mm chain we offer. We recommend either the Viro "Euromonolith" Padlock or the Laclede Padlock. 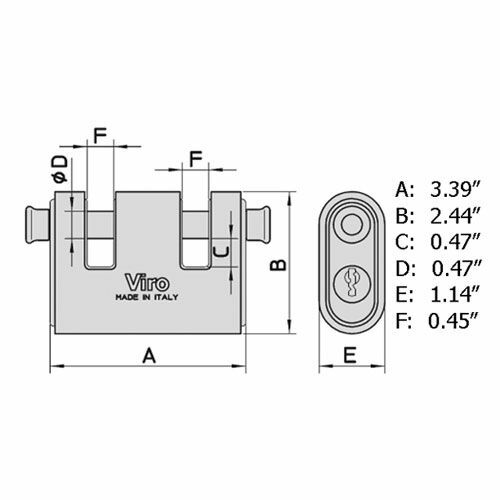 After looking at the Viro PDF page, the lock shown on your webpage shows a Viro with independent lock-bolts. They also have a single bolt version that locks both links of the chain. I just want to know for sure the lock pictured on your site is the one I am ordering. Yes, if you click here to view the PDF page, you will see at the bottom we are offering #4126. We also have a dimensional drawing of the lock on the page as well. You are indeed ordering a lock with two individual pockets. 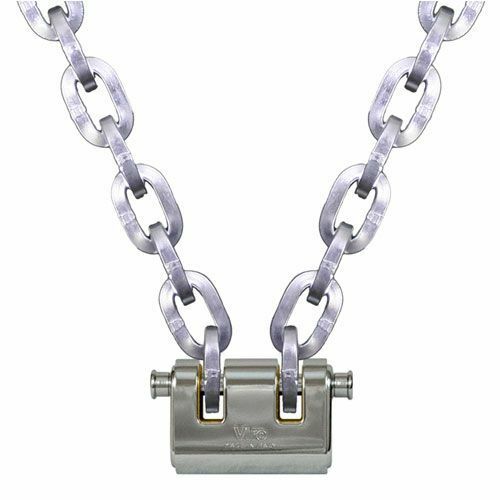 I am purchasing some Pewag chain from Westech and need 2-3 Viro "Panzer" 3/8" Security Chain padlocks. Can I get the locks all keyed alike? Yes, please click here to see the #4126 lock keyed alike. I brought this lock and there is no doubt it is well made and built to last.